Time to Turn Texas Blue? It appears that my initial criticisms were a bit premature. Today, much of the news media has been dominated by the roll out of Battleground Texas… a grassroots initiative aimed at making Democrats competitive in the state. Founded by former OFA director Jeremy Bird, the new organization has promised to make a long-term commitment to Texas Democratic causes. Needless to say, this is one Texan that is impressed with today’s events. He correctly points out that since 2004, Dallas County and Harris County (Houston) have flipped from a Republican majority to a Democratic majority. 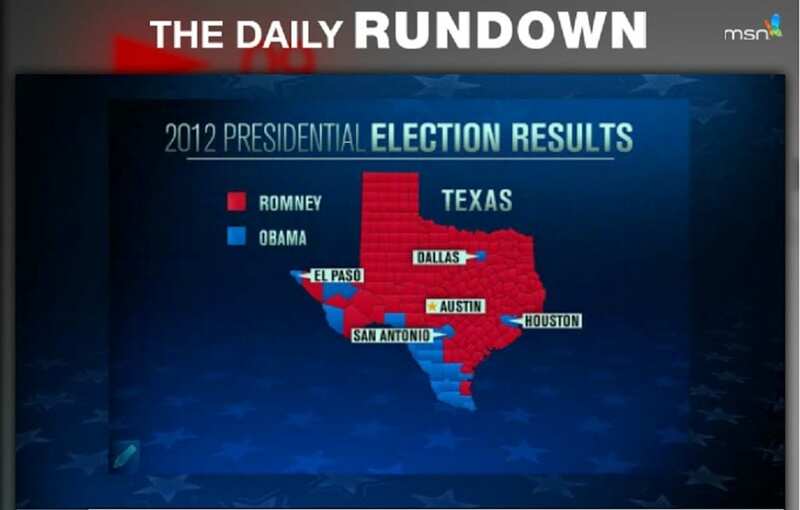 But his map suggests that Travis County (Austin) is somehow a red county? No… actually Travis county has been majority Democratic since the 1990s!! If we’re going to have a discussion about how Democrats can advance in Texas, it’s critical that we start that discussion with an accurate picture of the state. In 2012, 4 of the state’s 5 largest counties voted blue, including Travis. It may seem like a small thing, but on a national show, it’s important to present factual information. Another issue continues to pervade national media coverage is the sole focus on demographic (racial) shifts. It’s true that the state of Texas is majority-minority, but it’s also true that plenty of Hispanic voters (the ones that show up to vote) are solid Reopublicans. But Texas will not go blue on any single statistic, and there’s one HUGELY important fact that people do not cover enough. Not only does Texas have a growing Hispanic and Asian population, but it also has a rapidly-growing URBAN population. The long-held stigma of Texas no longer holds true. The majority of Texans now live in the state’s core urban areas… Dallas- Ft. Worth, Houston, Austin, San Antonio and El Paso. As the state continues to condense it’s population, it also takes on more characteristics of other large cities around the country. Millions of Americans have moved from all over the country thanks to continued Texas job growth, and as luck would have it, they are also bringing their political beliefs with them. And they’re mostly moving to the urban areas. Texas will not become blue by the growth of the Hispanic community alone. But if we can turn blue, it will be due to the confluence of rapid domestic migration AND changing racial demographics. These two trends have to move toward Democrats in tandem, along with an overal increase in voter participation. Groups like Battleground Texas and local organizations have to continue to expose the great travesties that Texans have suffered under Republican governance, like draconian cuts to our state’s education funding, and Governor Perry’s refusal to expand Medicaid. Like the rest of the nation, the doors to a blue Texas continue to swing open thanks to the continued failings of the GOP. But if we’re going to get there, it is critical for Progressives and the Democratic Party to come to state, talk to voters, and get a better understanding for what’s really going on down here. 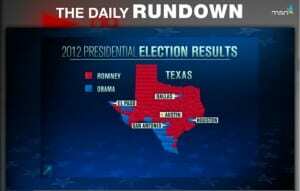 I invite MSNBC to broadcast some shows from the great state of Texas. Come to cities like Austin and Houston, and meet some of your faithful audience members. Show the rest of the nation that when it comes to turning the state blue, Texas Progressives are ready to rodeo. FLOTUS and Jimmy Fallon Mom Dance!! ICYMI The First Lady of the United States is going viral at the moment. Michelle Obama and Jimmy Fallon on the evolution of “Mom Dancing”. You’ve probably seen it already, but I can’t stop watching… so here you go!! As 21st century people, we’re pretty used to rapid innovation. After all, the very notion of this blog is less than 20 years old. Some of the innovations that we can’t live without… phones that double as personal computers, cloud storage, digital transmission… must have seemed like a distant pipe dream before we had them. Though sometimes, when I’m downloading a song to my iPhone, I do have to just stop for a second and marvel at how rapidly the process of acquiring music has changed. Sometimes the pace of change is so fast that we don’t realize that combining these innovations can be a huge leap forward in itself. Well, the city of Houston, Texas is “literally” going to turn trash into treasure. With the revolutionary ‘One Bin For All’ plan, citizen waste disposal and recycling will become a relic of the past. Houston, under Mayor Annise Parker’s leadership, wants to create a state-of-the-art waste facility that will specialize in ‘total reuse’… reclaiming recyclables from every piece of trash in the city. The plant will combine the lastest technology of digital imaging, filtering and sorting to create a high-speed, high accuracy concept. If successful, this would cut down the city’s landfill usage by a whopping 75 percent. Of course a plant like this is expensive… with an estimated cost of $100 million dollars. But by turning all city trash into net recycling, the city creates jobs, saves time, and wastes less. And of course the payback to the environment is even better than money could buy. As an entry in the Bloomberg initiative, Houston has the chance to make One Bin For All a reality. This is not to say that there aren’t other fantastic finalists in the Mayor’s challenge… I would encourage you to check out all of the entries through Huffington Post. But this blogger’s all in with One Bin For All. Texas Health Scare: MediCaid, or CrisisCaid? In a week filled with more eye-catching stories like the Oscar Pistorius murder saga and the looming “Republiquester”, it’s perhaps not surprising that Healthcare news isn’t on the front burner. But make no mistake… some news out of the Sunshine State is THE most important story of this week. Last summer, after the Supreme Court’s shocking decision to uphold the Affordable Care Act, Republicans immediately stood up in defiance. The Governors of Texas, Florida, Arizona and other GOP-led states pledged then and there to fight every provision of Obamacare until their last breath. Florida Governor Rick Scott could be said the main instigator of this… after all it was his state that was the first to file suit against the law. “While the federal government is committed to pay 100 percent of the cost, I cannot, in good conscience, deny Floridians the needed access to health care,” Scott said at a hastily called news conference at the Governor’s Mansion. So basically… Rick Scott had to eat it. He finally sat down at his desk, looked at the PEOPLE and the MATH converging, and decided that the lives of over 1 million Floridians would benefit from Obamacare’s Medicaid provision. Make no mistake, this is a humongous win for President Obama and the Democrats, but more importantly, it’s a win for the life and health of the citizens of Florida. If the state legislature follows Governor Scott’s lead, lives will be saved in Florida. People will get care in Florida. Now on to the true point of this article… when is Texas Governor Rick Perry going to see the ligtht as well? For all that Florida stands to benefit fom Medicaid expansion, Texans are in an even greater need. –1 in 4 Texans are uninsured. That’s over over 6.2 million people as of 2010, and more uninsured than any other state. -These uninsured people have no but choice to seek the emergency room. As a result they drive up Healthcare costs for everyone else. The average cost to treat a minor ailment in the Doctors office? $56.21. In the emergency room? $193.92. That’s almost 4 times the expense as it would be going to the doctor for a similar ailment (much less waiting until it becomes WORSE). Guess who absorbs those costs? And Texans wonder why our healthcare costs are soaring. –Only 50% of working Texans have health insurance… 49th in the country. The common misconception here is that employers are supposed to offer some form of a health insurance plan. That wasn’t actually a law until the passage of the Affordable Care Act. As a right-to-work state with a plethora of low-wage jobs, Texas companies have very little incentive to offer health insurance. So contrary to popular belief, it’s not just those on welfare in Texas that are struggling to find health care. It’s many of the employed public too. Let’s get personal for a second. The “bleeding-heart Liberal” in me wants to thank Rick Scott for his moment of clarity and sincerity, and celebrate this win for Florida, Democrats and affordable Health Care. But this is NOT the time to become complacent. The moment is now to put pressure on Governor Perry to do the math for our state. Even as he touts the “smoke and mirrors” budget surplus, Texas families are being devastated by employers that refuse to even offer health insurance (and are trying to sue their way out of it now that it’s mandated by Obamacare), and are continuing to lose sleep over that nagging health issue that they simply can’t afford to deal with this month… or the next… or the next… until it’s too late and becomes a life-or-death issue. We know that Medicaid isn’t perfect, but it’s a VAST improvement from “CrisisCaid”- the spiral so many Texans face where the emergency room is their only option. This is the moment for Texas Democrats to put pressure on the Governor. With now 7 GOP-led states biting their tongue, Rick Perry will be forced to follow suit. And if even doesn’t, Texas Democrats should carry it all the way to the 2014 ballot box. So Gov… what’s it gonna be? That clock is still a-tickin’. The history books will certainly be full of stories about Pope Benedict XVI… and in recent weeks he’s guaranteed that they will not all be related to his active time in the Papacy. The decision to resign is extraordinary in itself, as he will be the first living “former Pope” since Gregory XII resigned in 1415. Who says history is boring? And of course the Pope has spoken to the world regarding this decision, citing mounting health concerns as his primary reason to abdicate the office. But one has to wonder if there is anything further to the story. Pope Benedict’s papacy hasn’t exactly been forward-thinking, at least not in his actions. He’s dealt with controversy since his term began, so even the mounting allegations of sexual misconduct by church officials is nothing new. Why the decision to break 598 years of precedent? Everyone is fixated up the decision to resign, but it’s also important to observe what other actions are being taken leading up to the abdication. Less than a year ago, long-time butler Paolo Gabriele stole top-secret papal documents, was jailed and finally pardoned during Christmas time. 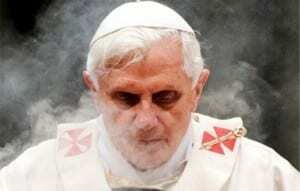 Though the papers didn’t target the Pope directly, it was a major breach of confidentiality within the Vatican. And this week, the International Tribunal into Crimes of Church and State has alleged that the Pope will seek “Legal Immunity” from the Italian government. The Vatican confirmed that Pope Benedict will be meeting with Italian President Giorgio Napolitano, but didn’t go into any details regarding the meeting. Reverend Kevin Arnett of the ITCCS made this allegation in an official letter to the Italian government. If found to be true, this opens up a bunch of new questions, some of which simply cannot be ignored. 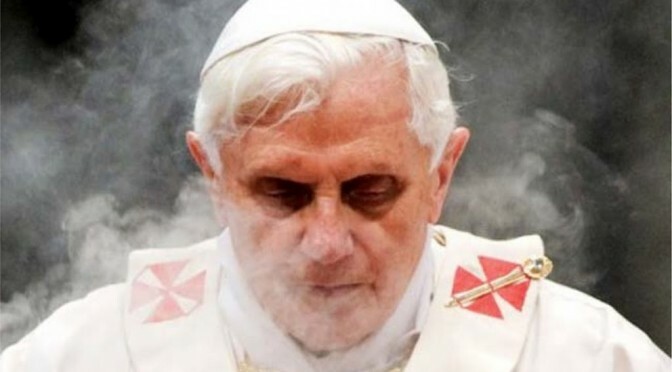 If Pope Benedict (soon to be known again by his birthname Joseph Ratzinger) is only retiring for health reasons, why would he need to seek legal immunity? As a former close servant to the Pope, does Paolo Gabriele have any information regarding this new developement? No matter what one may personally think of the Catholic church, it is still an organization that has over one Billion followers, and its actions reach every corner of the globe. It is a gigantic provider of care for the poor, and needy. Which is why it is perhaps more important than ever before that the world receives answers about wrongs conducted by church officials. Even if those officials were once the Pope. A hearty thank you to the voters of Massachusetts for giving our country SENATOR Elizabeth Warren!! In the course of one Senate hearing, Elizabeth Warren has perhaps done more to combat Wall Street eccentricity than any other elected official in decades. I agree Senator… “Too big to fail” has certainly become “Too big for trial”. If the average citizen has to be drug through the country’s legal system whether or not they are at fault, the Big Banks shouldn’t be any different.